Whenever I need to get somewhere, I always wind up getting there early – way before anyone else and, usually, even before the person who invited me. And this isn’t a boast, either – in fact, it’s the exact opposite; I think it’s something of a failing on my part. I’d like to explain why in this post. My burning desire not to be late and to ensure that I always put the interests of the people I’m meeting or about to spend time first with means I rarely have to make apologies, but has also resulted in some pretty stressful days. This is for one very simple reason; somewhere along the line, I forgot to invest time in myself. As a result, my happiness dipped which in turn led to a significant dent in my ability to be productive. I do the same thing in my working life. As a freelance writer, I have a diary full of commitments and deadlines and I hate the prospect of missing them. As a result, I spend an inordinate amount of time fitting in as many jobs as possible in order to keep my clients happy. Little did I know that in doing so I was ignoring my most important client – me! I love ticking items off my to-do list. In fact, I live by it, but that’s often to my detriment. Until recently, I worked solely from a daily to-do list. And that’s great, until you realise that it isn’t allowing you to see the bigger picture. By taking a step back, I’m now able to set far more lofty, long-term goals that will help sure-up the future of my business. Like anyone, I’m rather fond of a holiday, but since going freelance, I’ve grown to fear time away from my office. What if the work isn’t there when I return? How will I get everything done beforehand? However, by saying “no” occasionally and setting realistic expectations with clients, I’ve been able to take more time off and, in turn, drop all aspects of my digital life just as they’re beginning to consume me. Every freelancer will be familiar with the constant worry that the next job will never arrive. 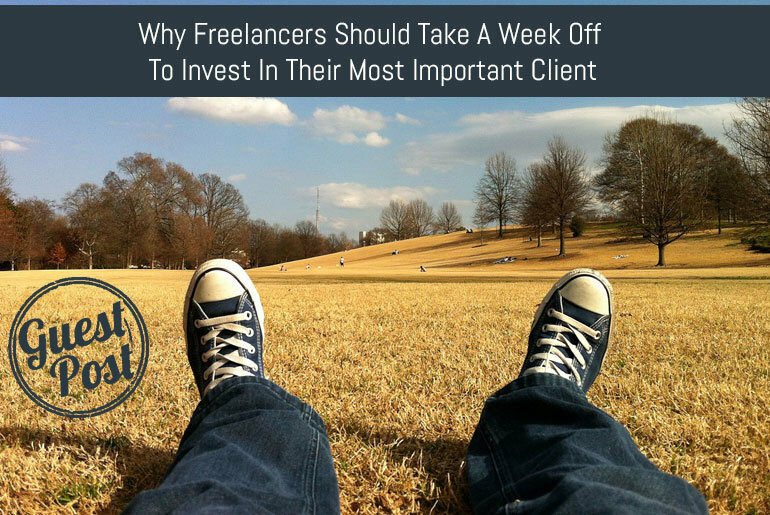 Invariably, it does, but assuming that will always be the case leads many to neglect one of the most important freelancing tasks. If you don’t market yourself, you’ll never build that all-important funnel of future prospects. By taking a few days aside to work on your own marketing and networking, you may not be indulging in paid work, but you will be preparing sensibly for the future. When I entered the world of professional writing, I did so somewhat naively. I didn’t realise how hard it would be to remain constantly creative and, as a result, my love of writing slipped a little. As soon as that happened, I knew I needed to do something about it, so set time aside to be creative in other ways. For example, playing the piano and making music are two hobbies I adore, and by investing more time in them, I quickly regained my love of creativity. That love soon filtered back into my daily work. No matter what you do as a freelancer, you can never stop learning. Unfortunately, I did. So packed was my diary and so complex my to-do list that I took my eye off the ball when it came to learning my craft. Looking back, this was daft; we’re surrounded by more accessible reading and learning material than ever before. Every inch of it was right under my nose, yet I failed to capitalise on the multitude of learning opportunities before me. That was, until I took time out, during which I read voraciously, and then did so some more. I returned to my work hungrier and more knowledgeable than ever. The nature of my work means I spend an awful lot of time by myself with only my laptop for company. When I’m in a particularly productive mood, this isn’t an issue – if anything, it benefits the type of stuff I do – but too much of it and I risk becoming severely isolated. Taking time away from my work enables me to re-immerse myself in society. That might sound rather dramatic, like I’m some kind of ultra-hermit or suffer from agoraphobia, but the opposite is true; I love being outside and spending time with people. As a solitary freelancer, I’m simply more at risk of forgetting the importance of those moments. None of this was easy – make no mistake. By the very nature of their working arrangements, freelancers will always fear taking time off. I did, but as soon as I realised the benefits of doing so, I never looked back. This is a good list for a reboot. I find that being digital all the time can sometimes put blinders on you and you get tunnel vision. I find taking a week long siesta from social media and digital and try to mingle with real life humans sans electronics is a great way to get some perspective. Good idea on re-thinking how to market yourself during this time.